Learn the basics of French Pastry through online culinary school. Build your skills and techniques step by step and take your cooking to the next level. Taught by Chef Philippe Salomon, professor of 18 years at Top French Culinary School Ferrandi. 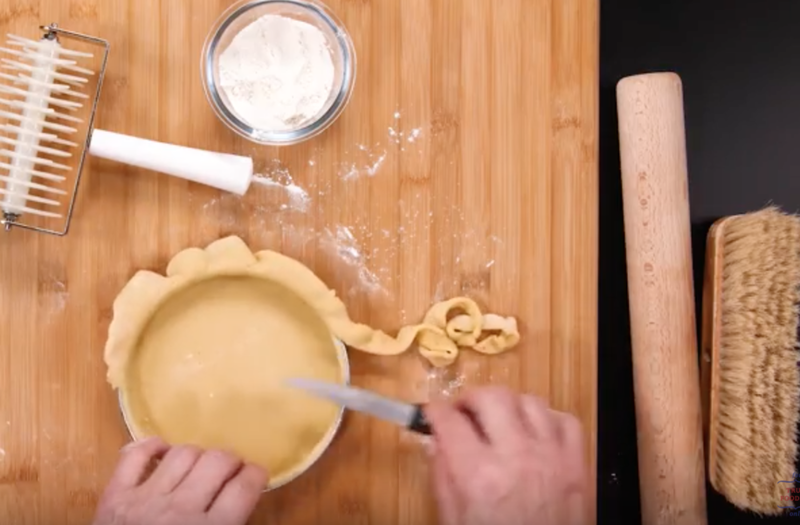 Parts 1 & 2 have over 30 lessons including Pastry doughs such as Pâte Brisée, Pâte Sucrée, Crème pâtissière, and full recipes of classic French Tarts such as Lemon Tart, Tarte Tatin, and Apple Tart. Certificate upon completion. Part 2 introduces more complicated Pastry techniques and recipes such as Pâte a Choux, Profiteroles, Paris-Brest and Chocolate Éclairs. Intermediate and Advanced courses to follow. French Pastry Foundation Level Part 1 is made up of 4 units. 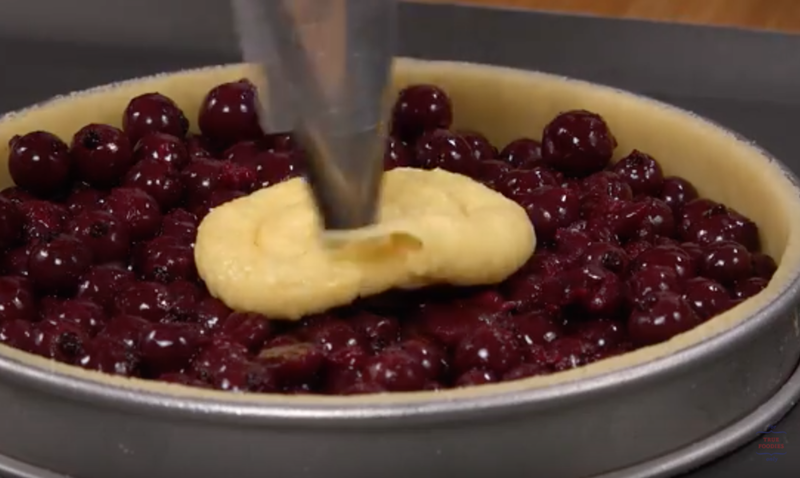 Each one introduces an important pastry dough, techniques, fillings, and classic French tart recipes that are made with these elements. In the first section you will learn how to make the essential pastry dough: Pâte Sucrée, two essential fillings Almond Cream and Crème Pâtissière Classique and use those skills to create 3 different Tarts. We then introduce the next pastry dough: Pâte Brisée, 2 classic French Tarts: Tarte Normande and Apple Tart as well as Flan, and the very special Tarte Tatin.Units 3 and 4 go on to introduce two more pastry doughs: Pâte Sablée and Pâte Sablée Breton, and some more sophisticated recipes such as Lemon Tart and Strawberry Tart. Pâte sucrée is a sweet pastry dough traditionally used for tarts. It is a short crust dough which means that the fat in the dough shortens the gluten strands by interfering with the process that elongates them such as occurs in bread dough. This results in a crumbly, tender crust. This version includes almonds which add a nice depth of flavor, but can be eliminated if desired. Crème d’Amandes or Almond Cream filling is made with almonds as the base ingredient and it is important to know how to make it in French pastry. It is used in many recipes, and as a base in many tarts and other pastries. 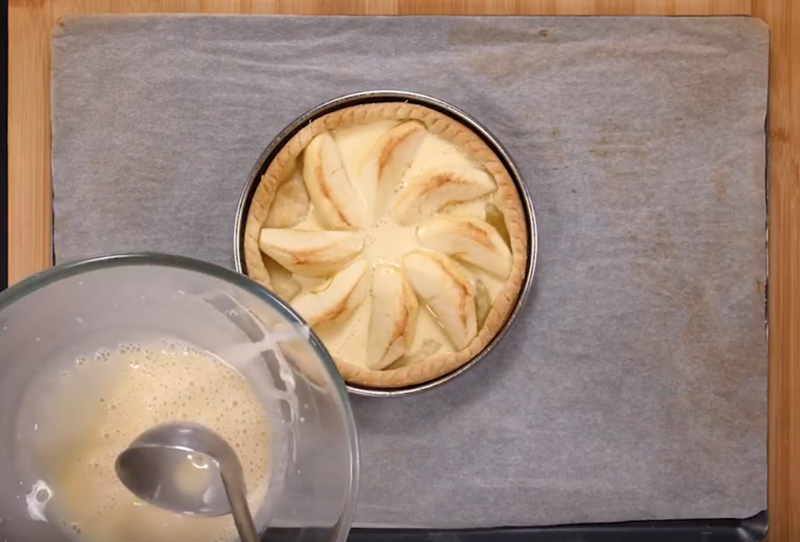 This lesson uses the Pâte Sucrée and Crème d’Amandes from Lessons 1 and 2 to make our first tart. Tarte Amandine is a versatile tart that can be finished with pears, apricots, chocolate, blueberries and other fruits. This version is with blackcurrants. Blackcurrants are high in natural sugars, however they also have a high acidity which means blackcurrant berries can add a great burst of flavour and colour to dishes without being overwhelmingly sweet. Tarte Bourdaloue is a French classic that was created by the pâtissier Coquelin after he bought La Pâtisserie Bourdaloue in 1909. The tart is still a favorite today, and the Pâtisserie Bourdaloue is still in operation. You can visit it at 7, rue Bourdaloue in the 9th arrondisement of Paris. 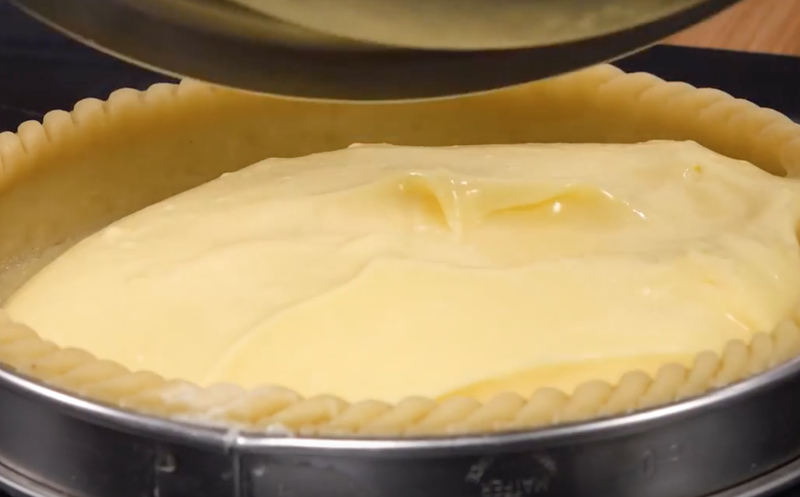 Crème Pâtissière - Classic Pastry Cream - is an essential part of pastry making. It is a thick, creamy custard used as a filling for cakes and pastries. In French it means literally “pastry cook’s cream” as it is used in many recipes such as soufflés, fruit tarts, profiteroles and mille-feuille. 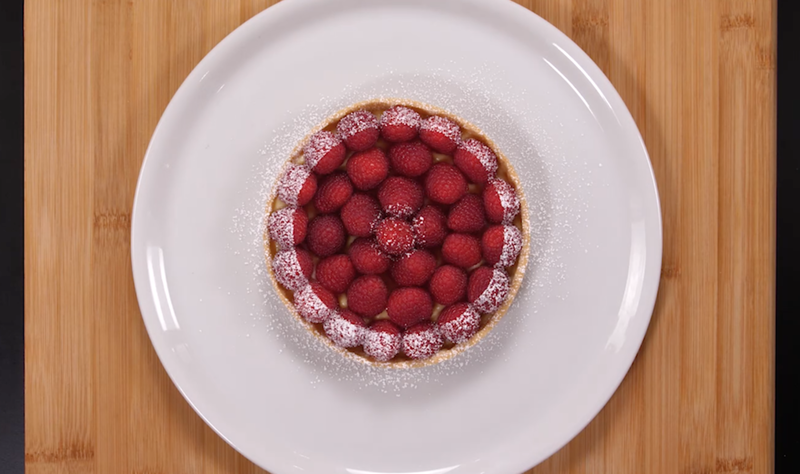 This lesson uses the Pâte Sucrée and Crème Pâtissiére Classique from Lessons 1 and 5 to make a classic Raspberry Tart. This tart is one that you will see in every French Pâtisserie and is a beautiful and elegant dessert. Pâte Brisée is a standard rich tart crust made with butter used for both sweet and savoury tarts and pies. Meaning literally “broken pastry” in French the first known use of the term was in 1824. While there is not a consensus on the exact definition of Pâte Brisée it is always a dough made mostly from butter and flour, with or without sugar. Tarte Normande is a traditional 19th century recipe. It is a variety of apple tart made in Normandy using pâte brisée and filled with apples, sliced almonds and a creamy egg custard. There are many varieties of Apple Tarts in France: Tarte Normande, Tarte Tatin and other versions. This version is the classic recipe, found in every patisserie in French and is as elegant as it is delicious with its beautiful spiral of apple slices arranged on top. In this lesson you will also learn how to make a neutral glaze. Glazes are liquid when heated but gel as they cool. The glaze is called "nappage" and the active ingredient is pectin, which is found in virtually all fruits. Glazes are used to add a beautiful shine to tarts and other desserts, and also to preserve the fruit. The glaze should be made in advance and can keep in the refrigerator for up to 2 weeks. Known as Flan Pâtissier, French Flan, or Flan Parisien - this is the tart that you see in patisseries all over France (the equivalent of a custard tart). It is a real treat, especially for children coming home from school, and holds a special place in the heart of many French as a nostalgic piece of their childhood memories. Stephanie and Caroline Tatin were sisters who owned the Hotel Tatin in Lamotte-Beuvron, about 100 miles west of Paris, at the turn of the 20th century. The story goes that one day Stephanie was making an apple tart and accidentally put the apples in the pan before the pastry. Not wanting to waste the apples she popped some pastry on top and cooked the tart anyway. When it came out of the oven, she turned it upside down – and the Tarte Tatin was born. Later on, the owner of Maxim’s, put the tart on his menu and claimed to have stolen the secret recipe by disguising himself as a gardener. This sounds good until you realise he was three years old when the sisters stopped cooking. Whatever the truth Tarte Tatin is another delicious classic apple tart in the French Pastry repertoire. Pâte Sablée is crisp and more cookie-like than other more flaky pie crusts. The name literally means "sandy”. It is a classic shortcrust pastry dough that, once baked, becomes the base for almost any tart. While other flaky pie crusts and doughs use cold butter, pâte sablée calls for the butter to be softened. The butter is thus fully incorporated into the dough. This creates a sandy texture in the dough and tender texture in the baked crust. This version is with almond powder to add flavor, but it can also be made without. Tarte au Citron is another classic and popular dessert in France. Particularly in Menton, said to be the only place in France where lemons grow, and where there is an incredible lemon festival each year in February. This version of the Lemon Tart is quite sophisticated and requires some more challenging techniques. Chocolate Mocha Tart is a delicious combination of chocolate and coffee flavors. It is beautiful and takes a considerable amount of skill. This recipe incorporates the techniques learned to date as well as introducing a mocha cream and two different piping tips and icing techniques. Pâte Sablée Breton originated in Brittany, a region known for its wonderful salt and butter. This pastry dough contains plenty of both which gives it a distinct and delicious flavor. It is a dough that does not need rolling and is a good choice for many light summer tarts. Pistachio Pastry Cream is another versatile filler used for a variety of tarts and desserts, and an essential cream to know for French Pastry. Strawberry Tart is another French classic seen everywhere in France and frequently part of summer garden parties or family get togethers when strawberries are in season. It builds on the last two lessons - using the pâte sablée Breton and pistachio cream as a delicious base with fresh strawberries on top. This seasonal fruit tart uses the pâte sablée Breton from lesson 15 as well as a crème pâtissière. It has a lovely fresh flavor and the fruits used can be varied according to what is in season and what taste you prefer. Pâte Sablée Breton Chocolat is a variant on the original Pâte Sablée Breton and is a delicious pastry crust for any chocolate based tart. This Chocolate Banana Tart uses Pâte Sablée Breton Chocolat and a banana filling. It is topped with a milk chocolate ganache. A ganache is a glaze, icing or filling for pastries made from chocolate and cream and used in many French desserts. This Tart is a lovely dessert for the the holiday season. It brings together all the flavors of mulled wine and uses some of the key elements you have learned in this course. Pâte Sucrée is the base, together with a crème d’amande and the tart is topped with a red wine glaze. 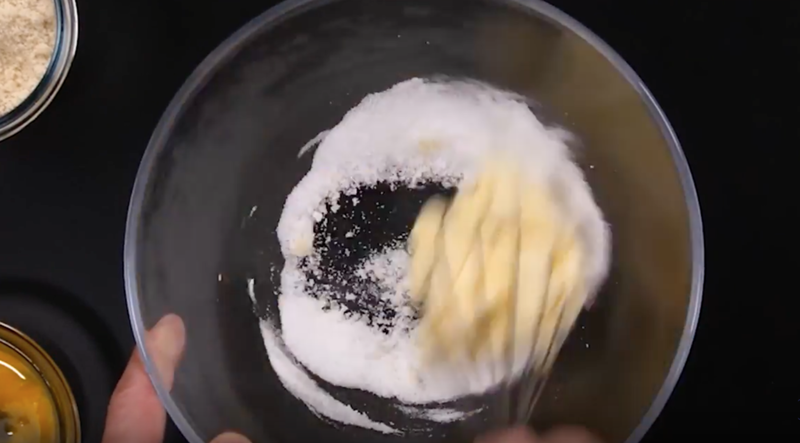 Part 2 introduces more complicated Pastry techniques and recipes such as Pâte a Choux, Profiteroles, Paris-Brest and Chocolate Éclairs. These lessons will increase your mastery of the fundamentals and let you create some of the most delicious French pastries like a professional. Chantilly Cream or Crème Chantilly is whipped heavy cream that has been sweetened. Vanilla can also be added. 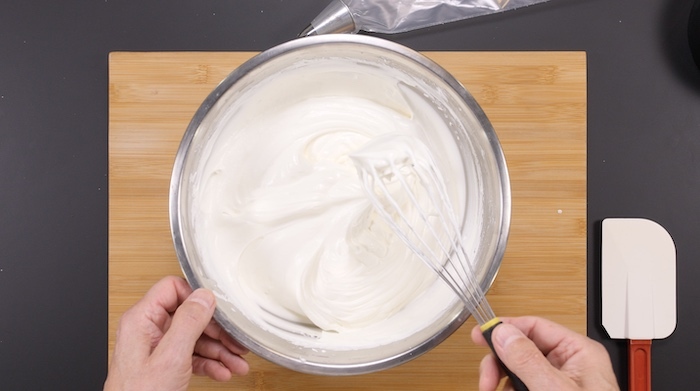 This delicate whipped cream originates from the town of Chantilly in Picardy, in the late 17th century. The recipe was created by the French Chef Vatel who elaborated it for one of Fouquet's banquets paying tribute to Louis XIV, at the Château de Chantilly (Chantilly Castle) in the Picardy region. It is an essential and delicious part of many French pastries. 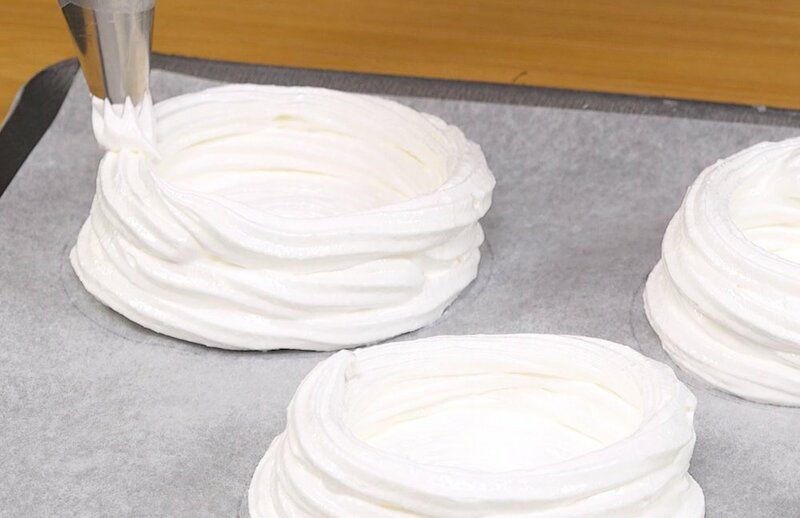 French meringue is a whipped mixture of sugar and egg whites. There are 3 types of meringue, French, Swiss and Italian. In this lesson you will learn to make the French version. It is most often used in soufflés and pastries. Meringue with strawberries and chantilly cream. This recipe brings together the techniques from the previous lessons into a delicious fresh delightful dessert. 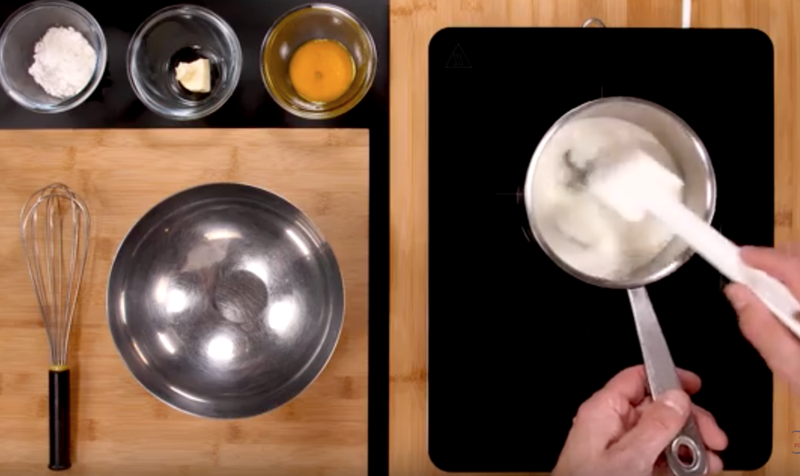 Meringue is a whipped mixture of sugar and egg whites. There are 3 types of meringue, French, Swiss and Italian. In this lesson you will learn to make the Swiss version which is often used for cooking crisp meringue cake layers. Fruit Pavlova is a delicious combination of crispy Meringue, Chantilly Cream and fresh fruits. In this version you will also learn to make Mousseline Cream, an important filling for many French pastries. Choux Pastry dates back to the court of Catherine de Medici in the 1600s when she moved to France to marry Kind Henry II. Over the years the recipe and name changed and evolved finally becoming Pate a Choux - named after the these little buns shaped like cabbages. The French word for cabbages being choux. 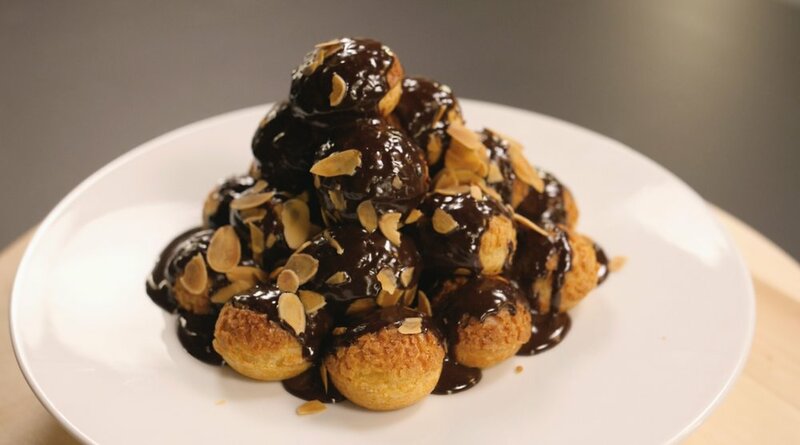 Profiteroles are also credited to the court of Catherine de Medici. Sometimes called cream puffs they can be made with different fillings and toppings. In this recipe they combine Pate a Choux with Chantilly cream and a delicious chocolate sauce. Paris Brest pastry was created in 1910 by Louis Durand, pâtissier of Maisons-Laffitte, at the request of Pierre Giffard, to commemorate the Paris–Brest–Paris bicycle race he had initiated in 1891. Its circular shape is representative of a wheel. It has recently become popular in restaurants around the world with many interesting variations being created. Éclair is the French word for lightning. The éclair originated in France around the turn of the nineteenth century and until 1850 was called “pain à la Duchesse” or “petite Duchesse”. It is made with choux pastry and filled with cream and topped with chocolate icing. The St. Honoré cake is a pastry named for the French patron saint of bakers and pastry chefs, Saint Honoré or Honoratus (d. 600 AD), Bishop of Amiens. It was invented in 1847 at the Chiboust bakery on Rue Saint-Honoré in Paris. This classic French dessert is a sophisticated combination of different pastries, caramel and chantilly cream. The Linzer Torte (or Linzertorte) is an Austrian torte with a lattice design on top of the pastry. It is said to be the oldest cake in the world and is named after the city of Linz, Austria. Linzer Torte uses a very short, crumbly pastry for this classic seasonal tart often eaten at Christmas in Hungary, Austria and Switzerland. Linzer Torte is a very short, crumbly pastry covered with a filling of redcurrant jam or, alternatively, plum butter, thick raspberryor apricot jam which is then covered by a lattice of dough strips. 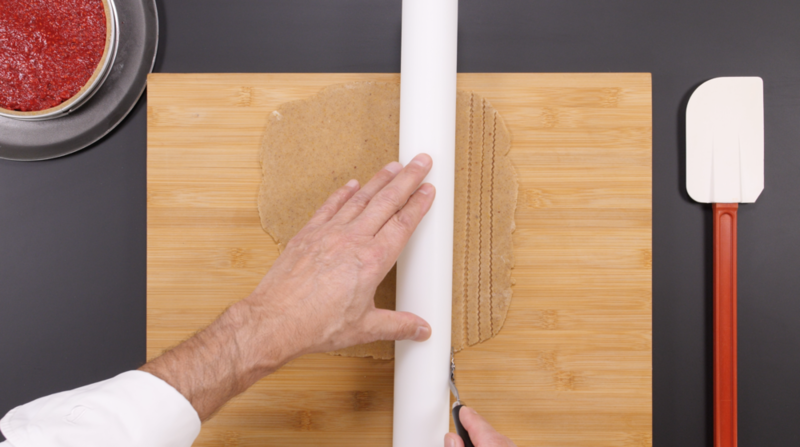 The dough is rolled out in very thin strips of pastry and arranged to form a criss-cross design on top of the preserves.